Poster of the Da Nang Chamber Music Festival 2017. 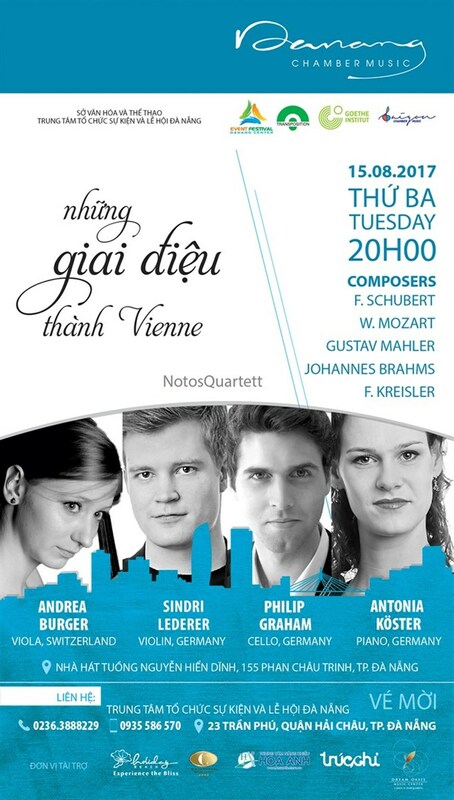 Da Nang (VNA) - The award-winning Notos Quartet will play works by Mozart, Schubert, and Brahms under the direction of Tran Thi Nguyet Sa at the third Da Nang Chamber Music Festival on August 15. Set up in 2007, the Berlin-based quartet consists of violinist Sindri Lederer, pianist Antonio Koster, cellist Philip Graham and violaist Andrea Burger. It has won the 2011 Parkhouse Award in London, first prize at the 2016 Schoenfeld International String Competition in China, and first prize at the 2017 International Chamber Music Competition Almere in the Netherlands. Pianist Antonia Koster was a student of Kalle Randalu at the University of Music Karlsruhe and completed her Master’s degree under the supervision of Ian Fountain at the Royal Academy of Music in London. She has cooperated with numerous musicians like pianist Elisabeth Leonskaja and French pianist Pascal Devoyon. Violinist Sindri Lederer finished his studies under the guidance of Christoph Schickedanz at the University of Music Hamburg and under Uwe-Martin Haiberg at the Berlin University of Arts. He gained further musical insights through renowned musicians like pianist Menahem Pressler and Emanuel Ax, and cellist/conductor David Geringas. The Da Nang Chamber Music Festival is the biggest concert by foreign artists held in the city. Tickets are available at the visitors centre at Da Nang International Airport, the city’s tourism portal and expat associations in Da Nang and Hoi An.